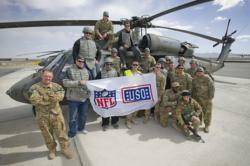 NFL players who excel on the field and in the community continue an NFL-USO tradition initiated more than 45 years ago as they embark on a week-long tour and uplift the spirits of troops stationed in the Middle East. I'm thankful for the opportunity to visit our service men and women overseas, said Takeo Spikes. "They take an extraordinary amount of pride in protecting our country and I'm very grateful for their commitment. This experience has been amazing. Twitter Pitch: Jason Baker, @dhanijones, Alex Mack, @takeospikes51 and @ericwinston return from @the_USO/@NFL tour. See pix, http://bit.ly/dwGpLo! The USO and NFL commemorated their 46 year partnership with a seven-day, two-country USO/Armed Forces Entertainment tour to Kyrgyzstan and Afghanistan March 2-9, 2012. Making the trek were Carolina Panthers punter Jason Baker, 11-year NFL veteran/Travel Channel host Dhani Jones, Cleveland Browns center Alex Mack, San Diego Chargers linebacker/two-time Pro Bowl selection Takeo Spikes and Houston Texans offensive tackle Eric Winston. During the tour, the group visited more than five military bases and lifted the spirits of more than 1,000 service men and women. Among some of the installations visited were Camp Stone, Camp Arena and Forward Operation Base Farah. Sharing a personal connection to the military is Jones, whose parents both served in the U.S. Navy as a commander and anesthesiologist and Mack, whose father served in the U.S. Army and cousin in the U.S. Air Force. A punter for the Carolina Panthers, Baker is one of the NFL’s fastest running punters. In 2011, he generated a gross average of 42.7 yards with 19 punts inside the 20, five touchbacks and long of 56 yards on 66 punts. Drafted as the 21st pick in the first round of the 2009 NFL Draft, Mack is a native of Santa Barbara, CA, and alum of the University of California - Berkley. Named after Japanese Prime Minister Takeo Miki, which means ‘Great Warrior,’ Spikes is a linebacker for the San Diego Chargers and has authored more than 1,300 tackles, 19 interceptions and two Pro Bowl appearances. An NFL offensive tackle, Winston graduated from the University of Miami in 2006 and signed on with the Houston Texans. In 1966, the NFL teamed up with the USO and became the first sports organization to send a group of players to Vietnam and other parts of Asia to demonstrate the league’s support for America’s troops. Over the past four decades, NFL stars including TERRY BRADSHAW, LARRY CSONKA, FRANCO HARRIS, HOWIE LONG, DON MEREDITH, LYNN SWANN and JOHNNY UNITAS have visited service members on NFL-USO tours in locations such as Afghanistan, Bosnia, Iraq, Japan, Korea, Kuwait and Somalia. In 2008, NFL Commissioner ROGER GOODELL, New Orleans Saints QB DREW BREES and New York Giants DE OSI UMENYIORA joined players on a USO trip to Iraq and Afghanistan. Last year, GARY KUBIAK, JIM E. MORA, JIM L. MORA, KEN WHISENHUNT, MERRIL HOGE, MATT MILLIAN, and ANTHONY MUNOZ were among the NFL greats and coaches who visited troops around the globe to extend their thanks. "I'm thankful for the opportunity to visit our service men and women overseas. They take an extraordinary amount of pride in protecting our country and I'm very grateful for their commitment. This experience has been amazing." “The USO tour has provided me a small glimpse of dedication and passion that our service men and women exude on a daily basis. Hopefully our visit will be uplifting for them and provide a small token of appreciation."